As pipe smokers and collectors in 2017, we are all blessed with an almost over-abundance of variety when it comes to pipes. It seems that most feel like we do like in the heyday of pipes, even though we are, in contradiction, all feeling the tightening reins of government regulations. These vast choices help to make it a fun hobby, but it can also be overwhelming at times. When it comes down to it, what seems to really dictate the flow of popularity in the long term is quality for price. Handmade items hold a special place in our hearts. Anybody can but a mass-produced widget, but a handmade one, lovingly crafted by a skilled craftsman with a good eye is a unique item to be cherished for a lifetime – and then by future generations. The cost is relative; as they say, you get what you pay for. This is what I think about when I set up to design and craft a pipe. Giving the collector and smoker what they are looking for and keeping it within a price that fits a wide variety of lifestyles. A pipe is a simple item, really, but there can be a great art in simplicity if it is appreciated for the function as well as the craft. Thank you for taking the time to check out my work. I hope you find your stay here to be enjoyable as you get to look at some of my work and learn more about what I have to offer. Just wanted to drop you a quick note to let you know that my new Rigsby pipe is smoking beautifully! I’ve run a couple of dozen bowls through it already, and like the one Bev owns, it delivers a terrific smoke. No tobacco shards get stuck in the air hole and I am using just a couple of pipe cleaner passes with each smoke. Can’t wait to take this beauty to the pipe club meeting this month and show it off. You done good, pardner… and congratulations again on winning your Most Improved Pipe Maker Award at the Vegas Show. If I were you, I’d snap a photo of it and show it off on your website. Also, let me know when you would like for me to do a blog and post a link to your website on my tobacco tins website for a month or so. Maybe that’ll promote a sale or two, hope so. 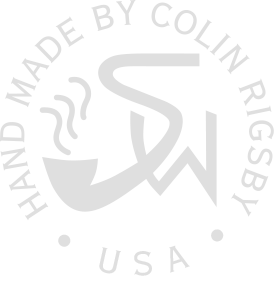 I’m smoking your pipe as I write this– absolutely love it–smokes beautifully! It was a real pleasure meeting and chatting to you at the show. If you have a mailing list, I’d love to be on it. My pipe arrived this afternoon as I was about to go out on some auto errands. A perfect time to fill it (about 2/3 full or so) and give it a test run. I like the size, shape and feel and open draw. It smoked pretty well for a first timer and with no bowl coating. I feel quite confident that it will adapt nicely to full latakia blends or I’ll know the reason why. So I know I’m going to be happy with it. The bowl did get a bit hotter than I thought it should, but I then refrained from hanging it out the window and nursed it just a bit and it will be a pipe I reach for often. Just started smoking the pipe you made for us at the Capitol District Pipe Club (Thru Russ Oulette-our leader)-I have been a pipe smoker for over 50 years and have over 100 pipes in my collection. I’ve amassed some really high-grade pipes and broke them all in thru a ritual that usually involved some “hot smokes” for varying break in periods. Yours provided the greatest smoke right from the start. I got one of the smooth blowfish designs and am more than pleased with the end result. I would be more than happy to be put on your “satisfied customer ” list. A pipe can be a dear friend, a beautiful work of art fusing man’s creativity with nature’s beauty. A vessel in which to enjoy your favorite tobacco blends. Above all, it must function at peak performance at all times. Service is dead in the world today; the old fashioned service that one expects when dealing one on one with an artist or seller. True service is part of what you will get when purchasing your pipe. Whether it is a piece from the site, in person at a show or communicating with me about a custom pipe; service is paramount. Please enjoy the site and check back often. If you are looking for a specific shape or finish, please fell free to contact me to discuss. I prefer the phone or in person to emails, but we will use whatever is best for you. Thank you, and remember that there is freedom in smoke….